SteelBook Alert: 65 Million Years and This Is the Best We Can Do? Lately, I’ve begun to wonder if all the artists who used to make such creative and visually appealing Blu-ray SteelBooks in years past have gone extinct. 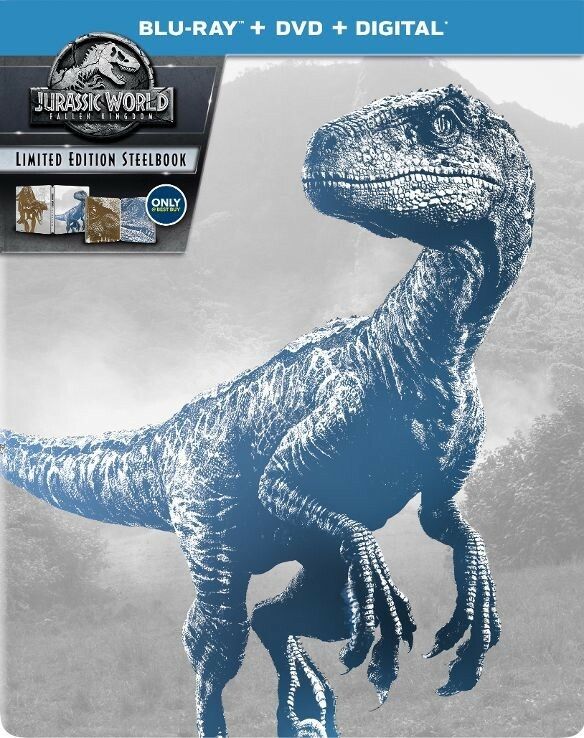 Judging by the upcoming ‘Jurassic World’ SteelBooks currently on preorder at Best Buy, the fittest of that species have certainly not survived. As if the Pop Art and comic book art fads that have desecrated countless recent SteelBooks weren’t bad enough, now we move on to this abomination. Seriously, what executive in charge of making decisions took a look at this and signed off that it was good to go? The standalone copy of just the newest sequel isn’t quite as ghastly, but it’s still not particularly original or attractive. What’s with the weird blue coloring? 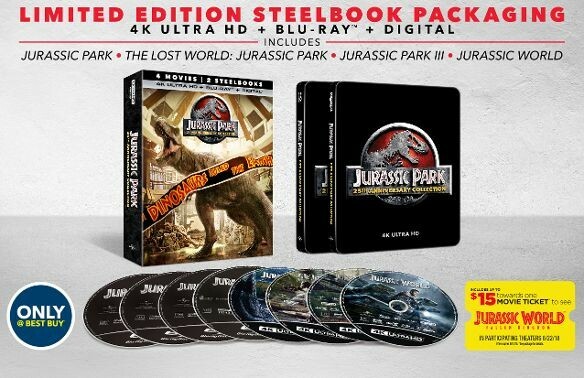 These were both announced just one month after the release of the franchise’s 25th Anniversary UHD SteelBook set, which contained only the first four movies without ‘Fallen Kingdom’. 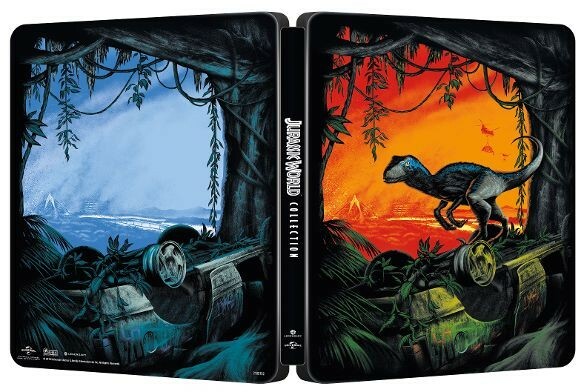 The artwork on those SteelBooks, featuring the JP logo on a plain black background, may be bland and uninspired itself, but is still far preferable to the new garbage. “Weird blue coloring” seems apt, for the raptor is called ‘Blue’. 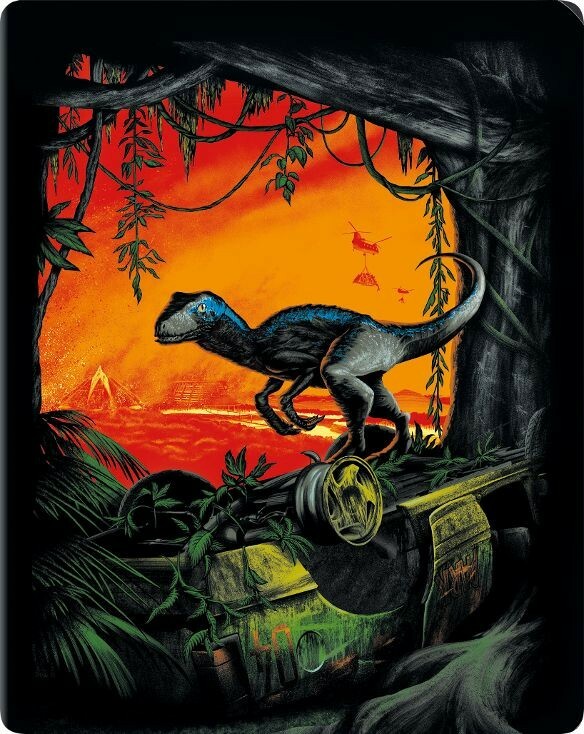 That collection artwork was the teaser poster released at Comic-Con when Jurassic World was still in production. Not sure why the author is so hostile towards it. It’s leagues above and beyond 99% of most cover art these days. You and I have very different taste in cover art, my friend. This one looks like the world’s worst paint-by-numbers drawing. It’s meant to dissuade everyone from buying physical media and turn to online rentals instead (also known as video on demand). Like carpets in casinos which look ghastly so that visitors don’t look down but up and insert the coins into the slot machines. No official logo – money saved. Don’t have to pay for likeness of actors – even more money saved. Even going that route, surely they could have come up with something that looks better than this! This seriously looks like a child drew it. Agree. This is corporate Cutting corners by allowing their 10 year olds a shot at the artwork. This is why US stinks at steelbooks (with some outliers). I get all mine from South Korea, China, Hong Kong & Czech Premium retailers…..and Zavvi. Ugh. This is why I stopped buying steelbooks – ugly artwork and Best Buy exclusives so you pay their inflated prices. Isn’t the point of a steelbook supposed to be that it looks good and you want to display it? I would keep these hidden. Zavvi usually gets better stuff, but lately, the releases they have been getting haven’t been that great either, and between the delayed UK releases and slow international shipping, I have gotten a few discs 2 months after their US release, sometimes forgetting I ever ordered from Zavvi and buying from Amazon, just to have another copy show up later. Yeah, I should keep better track of my purchaches, that is my own fault there, but still, on a good day, there is usually at least a two week delay even if the release dates are the same, due to international shipping, and then good luck getting the digital copy to redeem (I have tried to outsmart it by using a UK VPN, which sometimes works, but usually doesn’t). I will stick to the regular release of this.